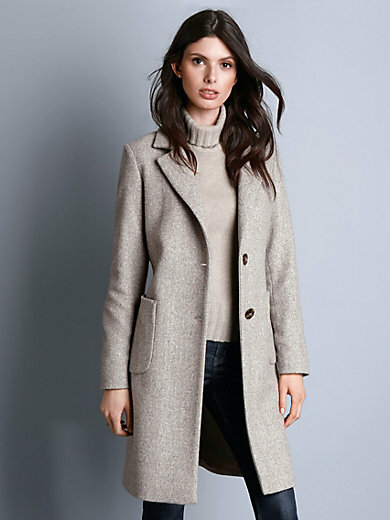 Coat by SCHNEIDERS SALZBURG: timeless chic in absolute premium quality made of soft cloth with a pretty drape, subtle texture and exquisite mottled look. High-class craftmanship from the SCHNEIDERS SALZBURG studio. Slim silhouette with revere collar, 2 patch pockets and a concealed back vent. 70% wool, 20% polyester, 10% nylon. Lining 51% acetate, 49% viscose. Length approx. 37ins. The coat should be dry cleaned.